A session is a type of workflow task. A session is a set of instructions that tells the integration service how to move data from sources to targets using a mapping. You create a session for each mapping that you want the integration service to run. The integration service uses the instructions configured in the session and mapping to move data from sources to targets. A session is a task, similar to other tasks available in the workflow manager. reusable sessions in the Task Developer. You can use it in multiple workflows. non-reusable sessions in the Workflow Designer. You can use it only in that workflow. In the workflow manager Navigator, double-click a folder to open it. Click Tools > Task Developer to open the Task Developer. 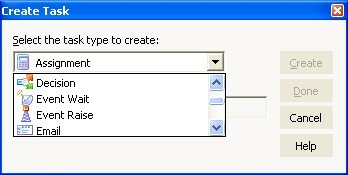 Select Session as the task type to create. In the workflow manager Navigator, click Tools > Worklow Designer to open the Worklow Designer. The Workflow Designer provides more task types than the Task Developer. These tasks include the Email and Decision tasks.